MC Extractor allows end-users and/or researchers to quickly extract, view, convert & report new microcode versions without the use of special tools or Hex Editors. To do that effectively, a database had to be built. The Intel, AMD & VIA CPU Microcode Repositories is a collection of every Intel, AMD & VIA CPU Microcodes we have found. Its existence is very important for MC Extractor as it allows us to continue doing research, find new types of microcode, compare releases for similarities, check for updated binaries etc. 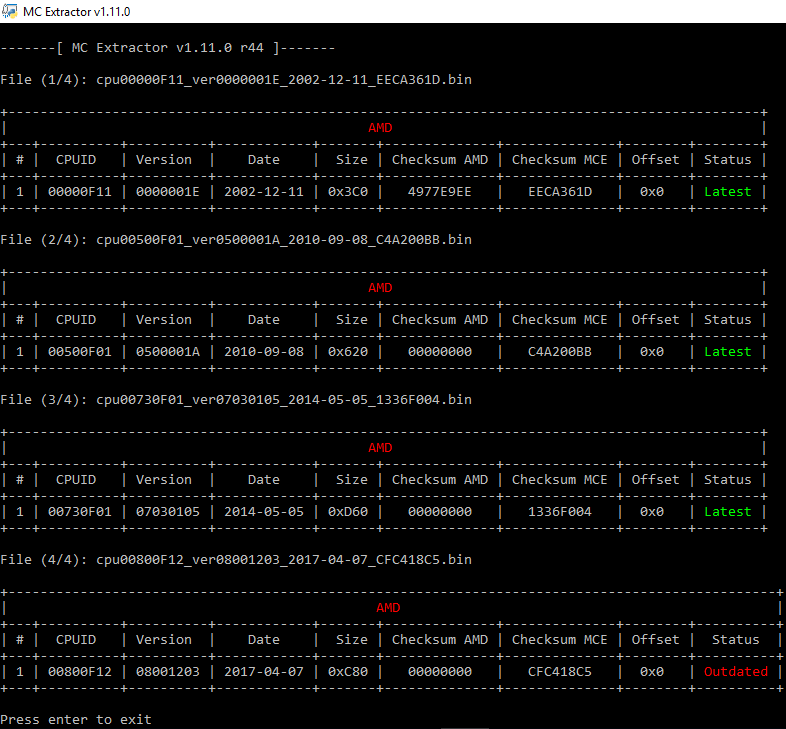 Bundled with MC Extractor is a file called MCE.db which is required for the program to run. It includes entries for all Microcode binaries that are available to us. This accommodates primarily two actions: a) Check whether the imported microcode is up to date and b) Help find new Microcode releases sooner by reporting them at the Intel, AMD & VIA CPU Microcode Repositories Discussion thread. MC Extractor was initially based on a fraction of Lordkag’s UEFIStrip tool so, first and foremost, I thank him for all his work which inspired this project. Among others, great places to learn about microcodes are Intel’s own download site and official documentation, Intel Microcode Patch Authentication, Coreboot (a,b,c), Microparse by Dominic Chen, Ben Hawkes’s Notes and Research, Richard A Burton’s Microdecode, AIDA64 CPUID dumps, Sandpile CPUID, Free Electrons (a, b), Freescale and many more which I may have forgotten but would have been here otherwise.